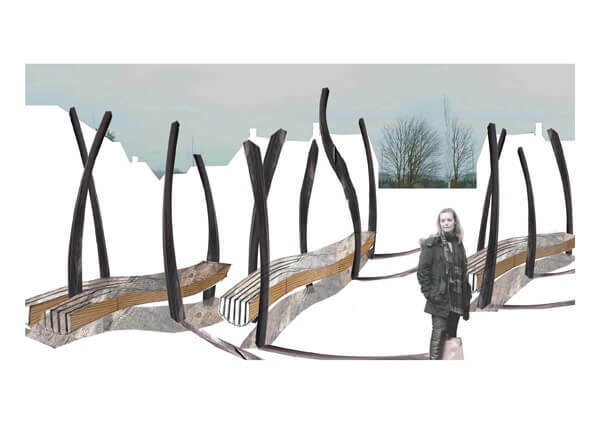 Of the 3 Shaftesbury public art projects I’m working on with Adam Zombory-Moldovan from ZMMA Architects, one has ground to a halt, one is in the design and planning stages and the last is actually physically underway. So, all in all, pretty good. 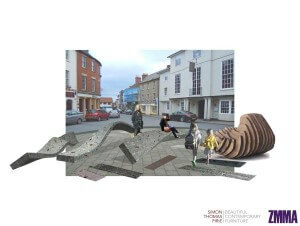 ‘Common Places’, the first of these projects in Shaftesbury town centre has hit some well organised vocal opposition. We are still listening to views and reviewing where we go with this project, but it is certainly not dead and buried from our perspective. The project also has lots of support from high places and perhaps most importantly from young people in Shaftesbury – 72% of children polled in Shaftesbury School liked the scheme when Jan Scott of Shaftesbury Civic Society presented the ideas earlier this year. I’ve said before good Public Art will never gain unanimoius support, by it’s nature it should be challenging in some way. Saying that I don’t think anything in the Common Places proposals is particularly radical and I fail to see what all the fuss is about. This has included requests for documents regarding the brief and artist selection proceedure from Dorset County Council through the Freedom of Information Act. It’s hardly top secret information that will threaten national security. Perhaps some people just have too much time on their hands! The other two projects relate to the work we are doing with Persimmon Homes on the new East Shaftesbury development. Mampitts Square, in the middle of the development, is still in the early stages of design, consultation and planning. I’m looking forward to showing the concepts of this exciting project very soon once planning has been granted. It’s fantastic that a big housing developer like Persimmon are incorporating Public Art at the core of their ideas and are showing some real open mindedness about the ideas. This week my focus has been on the first Persimmon Homes project though – The Rickyard. This had been held up for a year, partly related to the speed of building and selling houses through a recession, but the green space and surrounding houses are now in the final stages of completion. The Rickyard (above) will see the installation of our curved sliced oak seating in the early Autumn. For me this is a really exciting project and a return back to my artistic roots. I trained as a sculptor before moving into furniture design, this project bridges both disciplines in a very creative way. It was very odd going out specifically to find logs that were twisted and bent, usually I’m looking for faultless straight butts for the furniture projects. This was more akin to the kind of wood shipbuilders looked for hull frames with a natural curve to work with. Nowadays this stuff tends to be firewood, so from an environmental perspective it’s very satisfying. I spent a hot Friday working with Will Miller, my aptly named chainsaw and wood-milling ace making sure what we proposed is actually possible. 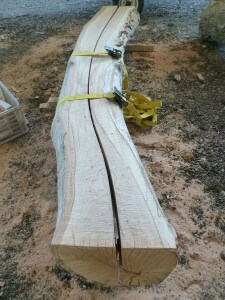 What we needed to achieve was to slice off parallel top and bottom surfaces of the length of the log – after selecting the best sides (more tricky than you might think on a 3 dimensionally twisted log that weighs a tonne!). 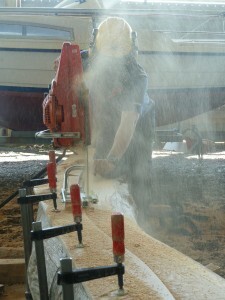 This was done with an Alaskan Chainsaw mill – a huge chainsaw suspended from a parallel frame, in this case a fixed softwood plank. 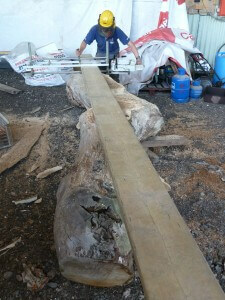 We ended up with a log with two flat faces 325mm apart. Once we had done that we had to test the vertical chainsaw cuts, potentially the most difficult and dangerous part. We have to create accurate jigs that guide the vertically suspended chainsaw to follow the natural curved shape of the log. We needed this to create a clean cut and after lots of set up changes we made a first perfect slice through the smallest of the logs. Every log will require 6 to 7 of these vertical cuts, in effect creating the optical illusion of a curving vertically sliced stack of wood. You can never tell how a day like this is going to go, we got less done than expected but somehow learnt stuff that will get us further along next time. 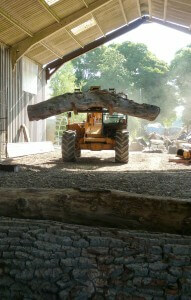 We’ve got another 3 days scheduled with Will for the log work. I’m really beginning to believe the final pieces will look just like the visuals now, very exciting! There will be more over the next weeks as the Rickyard Project takes shape.